On this week’s edition of FUEL TV’s UFC Tonight, it was announced Seattle will host the most star-studded freebie fight card in mixed martial arts history. “UFC on FOX: Henderson vs. Diaz” takes place December 8th inside Key Arena in Washington. This marks the UFC’s second venture in Seattle. The same venue held “UFC Fight Night: Nogueira vs. Davis” in March 2011. For the first time since the Octagon’s primetime television debut, a title will be up for grabs on free TV. 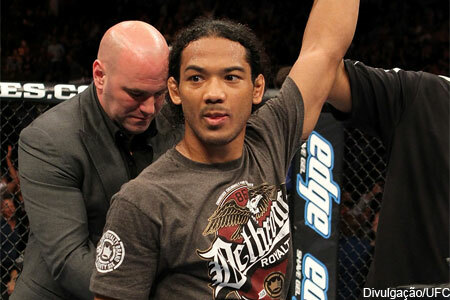 Lightweight champ Benson Henderson (Pictured) defends his crown against Nate Diaz in the show’s featured attraction. Former light heavyweight champion Mauricio “Shogun” Rua, who just starred in the UFC’s most recent show on FOX, meets up-and-comer Alexander Gustafsson in the night’s co-main event. BJ Penn will make his anticipated return to action against Rory MacDonald in the card’s third-to-last contest. One yet-to-be announced bout will round out the main card. FOX will broadcast the featured fights live beginning at 8PM ET/5PM PT.